Enroll in the Testmasters PE Electrical (Power) Online Course for only $1,499! 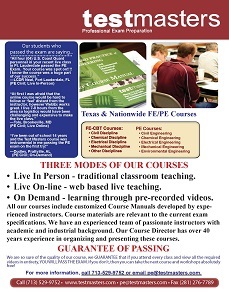 We guarantee that you will pass the PE Electrical exam. If you attend every class, do the necessary assignments, and don’t pass the exam, you can repeat the next online course absolutely free. That’s how serious Testmasters is about quality.